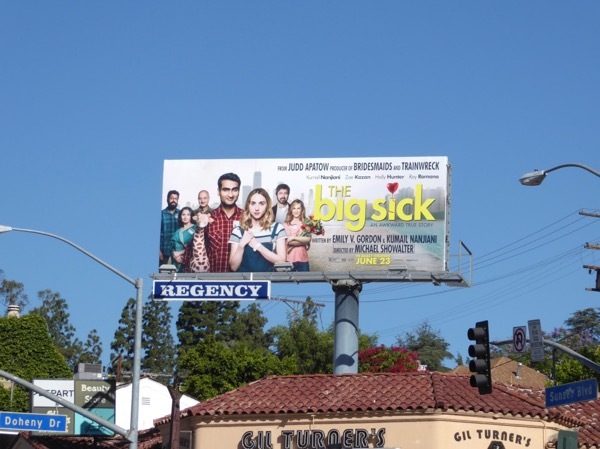 The Big Sick cost $5 million to make and has grossed over $55 million at the box office globally to date, and it may have been snubbed by Golden Globes, but there's still time for this scrappy feel-good comedy to prevail this awards season. 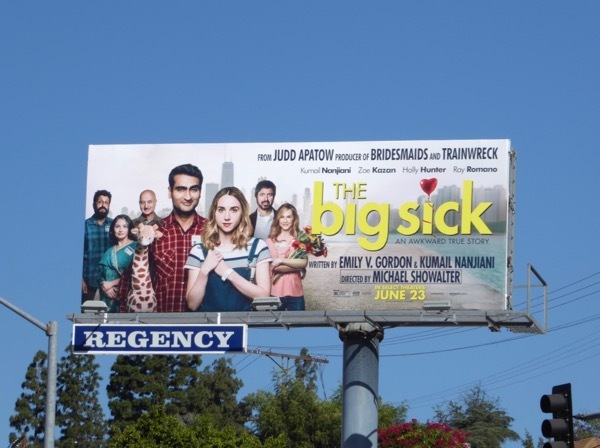 Based on the real-life experiences of Silicon Valley's Kumail Nanjiani and his wife Emily V. Gordon, the story follows the Pakistani American comedian trying to get his big break on the stand-up circuit in Chicago when he is heckled by 'Emily' (Zoe Kazan) at one of his gigs, and a one-night stand turns into a more serious relationship. Things get messy when she discovers his family are trying to organise an arranged marriage for him, they break up and Emily falls ill, is rushed to hospital and is put into a medically induced coma. At the hospital he meets her feisty parents who know about the messy breakup, and is ultimately forced to face his feelings for his sick ex-girlfriend and his family's own cultural expectations for him. 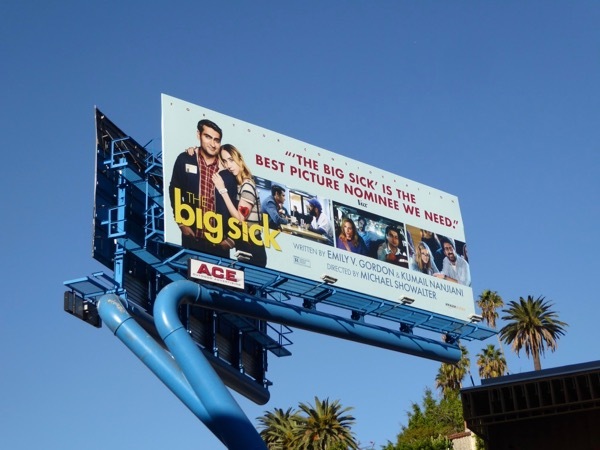 The movie launch billboard was snapped above West Hollywood's Sunset Strip on June 27, whilst the awards consideration billboards were spotted above Robertson Boulevard, Fairfax Avenue and the Sunset Strip from December 1 to December 21, 2017. 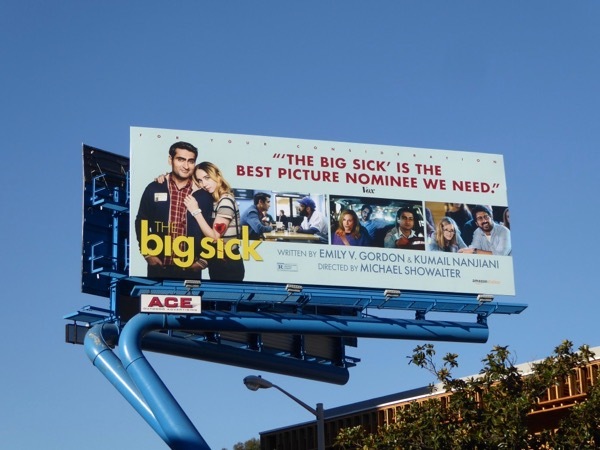 You can also see more of Kumail Nanjiani in these Silicon Valley TV series billboards. 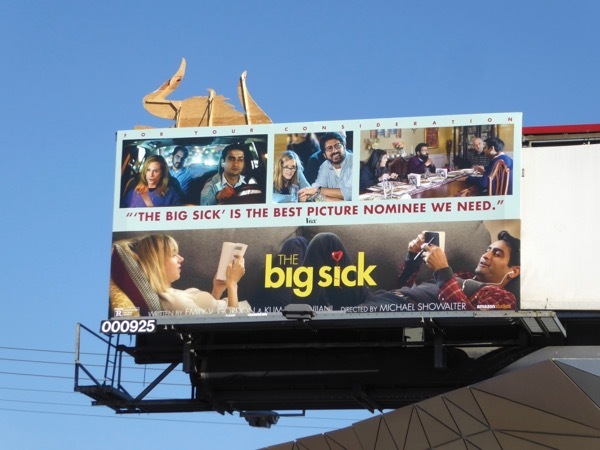 The movie has already been nominated for a Screen Actors Guild Award for Outstanding Performance by a Cast, plus Outstanding Performance by a Female Actor in a Supporting Role for Holly Hunter (for playing Emily's mother), so there's still time for The Big Sick to take home some industry accolades this awards season. At a time when the United States has become more divisive than ever, a film about love and cultural diversity in America is more timely and welcome than ever. 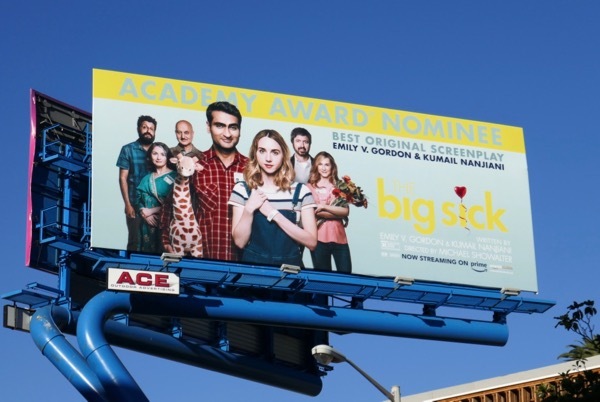 UPDATED: Congratulations to The Big Sick for its Academy Award nomination for Best Original Screenplay, shared between Kumail Nanjiani and his real-life wife Emily V. Gordon. 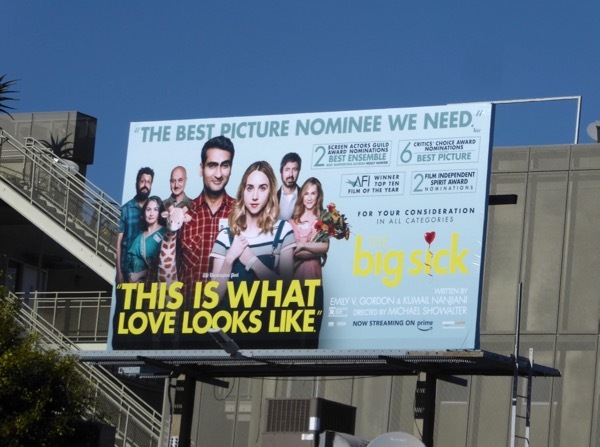 This Oscar nominee billboard was snapped above the Sunset Strip on February 1, 2018.